Ahhh, another Green Glass submission ! Weeeee, this is worth coming home from my job. ;-) ! GREEN GLASS has outdone itself on this one. It's really gorgeous. The overflowing looong dress really complements the background. Really beautiful. Quote by PrairieDogGuy2006Ahhh, another Green Glass submission ! Weeeee, this is worth coming home from my job. ;-) ! but it's a beautiful img! 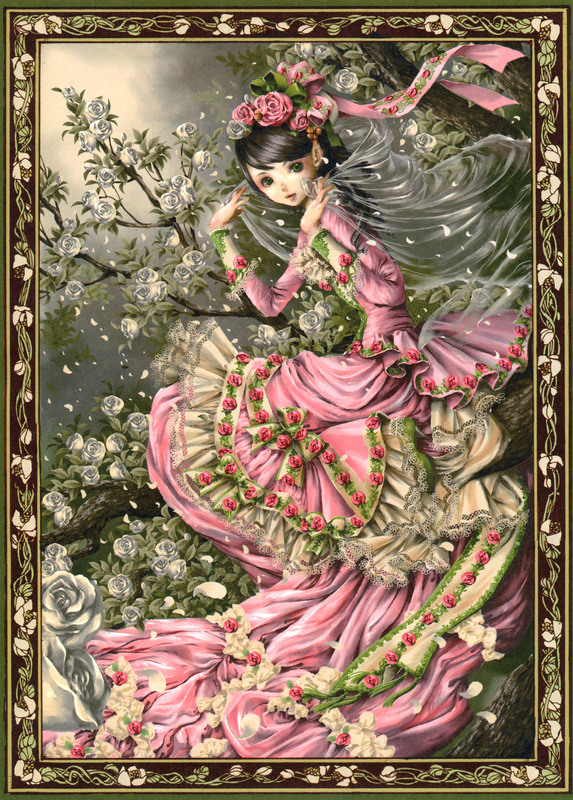 I always hate shrinking down scans like this so they can be my wallpapers, because the detail of the lacework is just mindblowing! How big must these original pieces be that she can get such fine detail in? Yahhh, C: another Green glass scan. Thanks saikusa! OK, pink is not my colour but this one is wonderful. The pink of her dress works perfect with the hole theme and gaves a bright contrast to the dark forest. Because of the frame around the pic it looks like a painting ready to hang on the wall. This is so pretty, delicate! The contrast created by the colours is so perfect! It's hard not fav this! lol, yes not safe. But so PRETTY! Another wow submission - I'd love something like this to hang on my wall. WOW, a really awsome pic^^! this is soooo pretty! thank you for sharing!